How do emerging states become full, functioning members of the international system? In this book, Cameron G. Thies argues that new and emerging states are subject to socialization efforts by current member states, which guide them in locating their position in the international system. Thies develops a theoretical approach to understanding how states socialize each other into and out of different roles in the international system, such as regional power, ally, and peacekeeper. The concept of state socialization is developed using role theory, a middle-range theory developed in the interdisciplinary field of social psychology. This middle-range theory helps to flesh out the theoretical mechanisms often missing in grand theories like neorealism and constructivism. The result is a structural theory of international politics that also allows for the explanation of actual foreign policy behavior by states. The foreign policy histories of the U.S. and Israel are analyzed using this theoretical approach to show how international social pressure has affected the kinds of roles they have adopted throughout their histories, as well as the kinds of roles that they have not been allowed to adopt. By considering the effects of international socialization attempts on their foreign policy behavior, Thies shows the well-known cases of the U.S. and Israel in a new light. 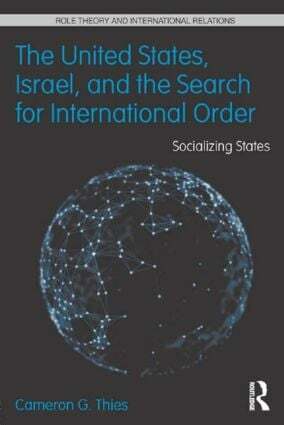 The United States, Israel and the Search for International Order argues that the process by which states learn their appropriate roles and behaviors in the international social order is crucial to understanding international conflict and cooperation, which will be significant for those studying both theory and method in international relations, foreign policy, and diplomatic history. Cameron G. Thies is Professor, Harlan E. McGregor Faculty Fellow, and Chair of the Department of Political Science at the University of Iowa. His research focuses on International Relations theory through the contributions of role theory, as well as state building in the developing world. He has published widely in journals such as World Politics, European Journal of International Relations, British Journal of Political Science, and International Studies Quarterly.